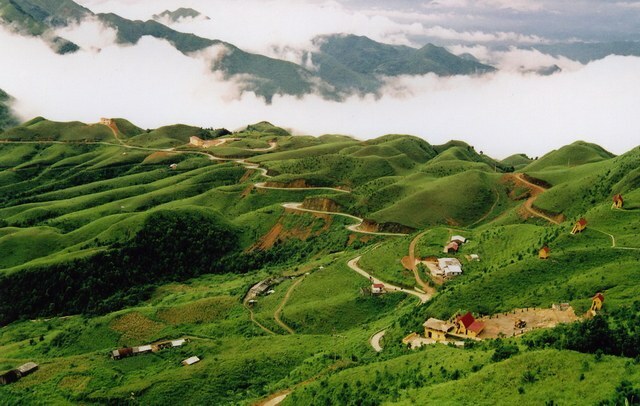 Moc Chau Highland situates 1050m high above the sea level. Acerca de 200 km to the North-west of Hanoi, this highland is 80km in length and 25km in width. The area covered by fields is about 1600 ha. It is not overconfident to state that Moc Chau is the greatest resource for Son La’s and North-western Vietnam’s tourism. Among all the special characteristics of the highland, the most precious resource of Moc Chau is its climate. This land has an annual average temperature of 20oC and a much more favorable winter compared to other parts of the region. The most typical tourism activity in Moc Chau is sightseeing. Ciertamente, there are hundreds of natural sites that can take your breath away. Adicionalmente, the highland’s collection of traditional festivals is another thing that attracts tourists from all over the country. Some of the places to check out are: Son Moc Huong Cueva, Chien Vien Pagoda, Dai Yem Waterfall, Phieng Luong Peak, endless pine forests, and the villages of the Dao ethnic groups. The music of ethnic people spreads all over the highland while the delicious traditional dishes and the local souvenirs enchant the tourists. Además, the highland is also close to many other attractions of the province such as Xuan Nha – Sop Cop ecotourism site. This is another place where you can find an immense area of primitive forest and many scarce animal species.